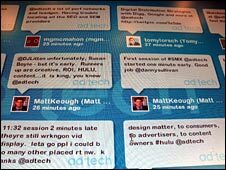 BBC NEWS | Technology | Can Twitter survive the hype cycle? Can Twitter survive the hype cycle? During the election, Barack Obama proved to be something of a trailblazer in using social media tools, such as Twitter, to get his message out and rally support. Now American celebrities are the latest group to join the Twitter party. The queen of TV chat shows, Oprah Winfrey, has taken Twitter to new heights. But nagging questions remain over Twitter's potential to be a successful business and be more than just another zeitgeist term for social media. Oprah joined the social networking group last week when she sent her first tweet live on air and brought Twitter into the living rooms of ordinary Americans. "It was a brilliant coup," said Ann Handley of Marketing Profs, who is also a regular twitterer with more than 28,000 followers. "A week ago I would ask my non-geek friends if they had ever heard of Twitter and they would say no. Today they know exactly what I am talking about and it's all down to Oprah," Ms Handley told the BBC. A survey by the market tracker firm Hitwise showed traffic to Twitter went up 43% as result of the Oprah effect. 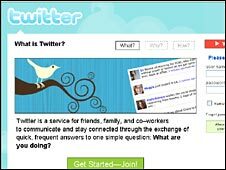 Twitter started in 2006 as a side project that was inspired by the "away" notices people would leave on Instant Messenger. "The messages would say things like 'away for coffee', 'not at my desk' and 'too busy to chat', which were not that interesting in and of themselves," explained Twitter co-founder Biz Stone. "The real trick was to look at all of these messages as a whole where they were kind of compelling and showed all these people out and about doing stuff." He said that prompted co-founders Jack Dorsey, Evan Williams and himself to build a prototype service, which they persuaded friends and family to use. Mr Stone said the first "mmm moment" came during a small earthquake in the Bay area when "everyone reached for their phones to Twitter as soon as we felt the earthquake". "Those tweets went out to everyone who cared about you and you got updates instantly that gave you a certain perspective on the earthquake." He said while they realised the service could "be something social with stronger implications", the big "a-ha moment" came during the South by Southwest conference in Austin, Texas in 2008. "There were enough people using Twitter at the conference by then that we realised how important a tool it can be during that type of environment where it is a shared experience," Mr Stone told the BBC. Mr Stone admitted that if the early response to the service had not been so positive, it probably would not have survived. "We literally built Twitter in two weeks and just put it out there to see if people liked it. If that early feedback hadn't been so supportive, I'm not sure we would have kept on the way we did." In the early days of Twitter, the service became overloaded and failed a lot. It became something of a joke at conferences in Silicon Valley but despite the downtime, users stuck with it. "We did try to do our best and when we did fail, we tried to do it gracefully or at least humorously. That was when the picture of the whale being lifted by all the birds came to be called the fail whale and people began to sort of gather around that," said Mr Stone. Such blips may have been accepted in the early days, but less so now. "At one point it looks like the fail whale was going to be a permanent fixture in the Twitterverse," said Patricio Robles of Econsultancy.com. "But when you run a free service, users are often quite forgiving." Big successes that helped put Twitter on the map have been breaking news stories. 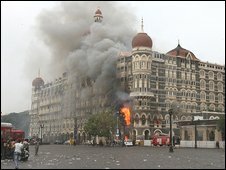 Information about the Mumbai attacks last November was transmitted via Twitter before many of the mainstream news channels. The same was true of the landing of a plane in the Hudson River in New York. Again Twitter was ahead of the news media, providing a real-time insight into what was going on as well as pictures from the scene. "It was a kind of mass network journalism, or crowd sourcing is another term for it. A lot of people are writing in, and that mass, that collection of data, creates the news story," Sue Robinson from the School of Journalism at the University of Wisconsin told the Daily Campus. Mr Stone said that what these incidents showed was that technology was about helping people in the best and the worst of circumstances. "We look at those things and take the idea that we want to extend this real-time network to the weakest of signals around the world. All it takes is a phone. Not a PC or a web connection. That's the strength that Twitter offers," said Mr Stone. Another growing Twitter community consists of brands and companies. Everyone from Starbucks to Verizon and from the Red Cross to United Airlines now has a Twitter account. "Twitter has changed the way businesses market and communicate with customers," said Marketing Profs' Ann Handley. "I am a Comcast customer and if I tweet about a problem, I will now get a response via Twitter. This is unprecedented in terms of the way companies have operated in the past. But there are still a lot of companies out there that are not sure how to leverage Twitter." Twitter itself seems to be in a similar boat when it comes to making money out of the service. "We are not feeling as dogged as people think about this issue," said Mr Stone. "We are looking at this this year and want to start showing progress on the revenue front. Right now we have plenty of time and plenty of money in the bank and patient investors. We are here to build a lasting company." But industry commentators worry that time is running out and such a laissez-faire approach threatens the company's survival. "Twitter is a traditional dotcom company. They have a lot of visibility but they are not making any money," technology analyst Rob Enderle of the Enderle group told BBC News. "Until they start making money to pay the bills, their likelihood of surviving is relatively low. "Oprah can't help you out if you are not making money. She rarely writes cheques to support non-profitable companies."